You may decide you would rather use Facebook to comunicate with just a few close family members and friends. You perhaps don’t use Facebook very often but its a great way to stay in touch. However….you DON’T want some old boyfriend or girlfriend from high school looking you up on Google search of Bing, finding your Facebook Profile and asking to friend you, and then you having to awkwardly refuse, as you really don’t want your weekend exploits to reach that far, and really… you NEVER want to talk with him/her again….ok! so he/she dumped you for your best friend….WE GET IT! Or maybe you have younger teens, who use Facebook to connect with relatives and a few family friends they don’t see very often, and again you don’t really want your kids to be found through public search engines….how do you hide your Facebook profile on public search engines? There is a little known, and hidden… in a weird place.. box you can untick which hides your Facebook profile from being able to be searched and found on public search engines like Google Bing and Yahoo. Be sure, as a precaution, to have “Friends Only” or “Me Only” ticked for every other option on your privacy settings first. Then un-tick “Let other search engines link to your timeline” and close. 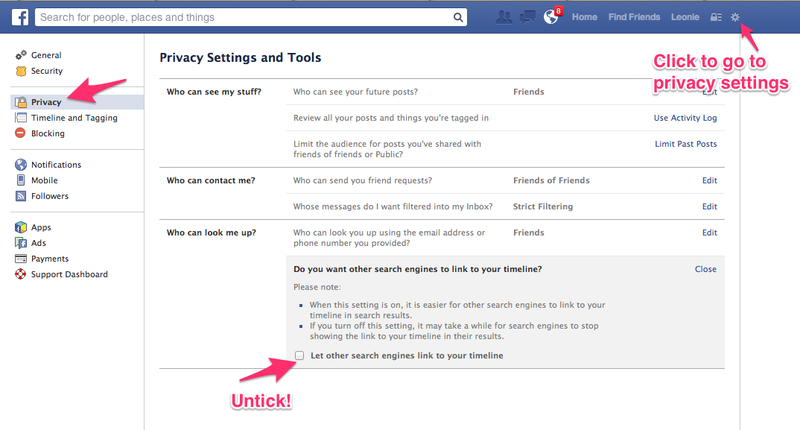 Your Facebook profile should now be hidden from public search engines. ← Why You Need To Enable Restrictions On Smart Phones And Mobile Devices For Kids!